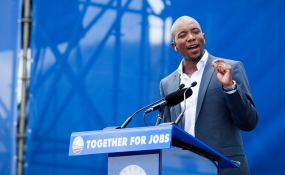 Former City of Cape Town chief whip Shaun August and four other councillors who resigned from the council this week have threatened to sue DA leader Mmusi Maimane for defamation if he does not retract a statement he made, intimating their involvement in maladministration. August and the others - Suzette Little, Siya Mamkeli, Thulani Stemele and Greg Barnardo - announced this at a press conference on Sunday. August was referring to comments by Maimane in his " Bokomoso" newsletter published by the DA on Friday, as well as comments to the media. He said that reports compiled by law firm Bowman Gilfillan (Bowmans), into allegations of maladministration at the City, "made adverse findings against some councillors". In a lawyer's letter released to the media on Sunday, the five councillors said that Maimane also said in various news reports that the Bowmans reports "made serious findings against those people". But the five say they were not implicated in the reports at all. They have demanded a public apology by Maimane by 18:00 on Monday night, or they will sue for defamation. Deputy chief of staff in Maimane's office Graham Charters told News24 on Sunday that Maimane would be responding to August's claims via his lawyers.